Six macropod species have become extinct in the past 200 years and a number of species are threatened or endangered. 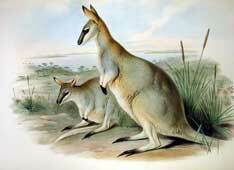 The elegant Toolache Wallabies were killed for their beautifully coloured fur, hunted for sport using greyhounds, lost their grazing areas to cattle and were killed by foxes. By the 1920s they were extinct. The number of kangaroos killed for profit is the largest number of native animals killed in any country in the world. Around four million (sometimes more) kangaroos are killed for profit each year. That's around 10,000 adult kangaroos every night plus their pouched and at-foot young. The species killed on the mainland are the Red, Eastern Grey and Western Grey Kangaroos and Wallaroos (also called Euros). They are killed for their skins to make leather products like shoes, for their fur and for meat and for pet food. Many people think that the kangaroos that are killed are farmed animals but this is not true. Kangaroos are wild animals that cannot be fenced, herded or transported without stress, serious injury or death. The kangaroos that are killed are wild animals shot at night in the Australian bush. When a shooter kills a female kangaroo with a joey in her pouch he pulls the joey out of the pouch and kills it too. He also kills the at-foot joeys that are too big for the pouch. A shooter is not allowed to sell the skins or fur of joeys and the joeys cannot survive on their own without their mother. The joeys often run away in fright when their mother is killed and die alone or are caught by a predator. It is likely that a million young are killed each year. Large areas of land are still being cleared for housing and shopping centres, farming, mining and timber logging. 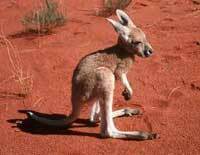 Every time land is cleared, the kangaroos and wallabies and smaller macropods are forced to move to a different area where food and water may not be available or they are killed. Kangaroos can live in a variety of habitats but long periods of drought reduce their food and water supply. This leads to many adult animals dying and joeys not surviving. Bushfires have become fiercer and more widespread in recent years. The Victorian fires in 2008 claimed the lives of huge numbers of wildlife. Thousands of kangaroos and other wildlife are killed or injured in road accidents each year. Kangaroos feed in the early morning and late afternoon at dusk. They are often hit when crossing from one part of a grazing area to another on the opposite side of the road. Organisations such as Councils, golf clubs and land developers apply for licences for shooters to cull / kill kangaroos because they don't want them in the area. Many farmers apply each year for licences to shoot kangaroos on their property because they say they are 'pests' on their land. Foxes are introduced predators that kill the small macropod species. Feral dogs and cats also prey on smaller macropods and the joeys of larger kangaroos and wallabies. Climate change will lead to higher temeratures and lower rainfall. Hotter seasons and unpredictable rainfall could lead to loss of more grazing areas and waterholes drying up. Gilbert's Potoroo is critically endangered and is Australia's rarest mammal. It is estimated that there are only 30 to 40 animals left in the single known wild population and 40 to 50 animals in two conservation colonies.